Cat seizures can be caused by multiple factors. Fluctuating blood sugar levels due to various medical conditions can contribute to your cat experiencing seizures. There are other causes of cat seizures that should be considered. Anemic cats experience brain oxygen shortages resulting in seizures. Toxins such as lead, antifreeze and chocolate can contribute seizures in cats. Infections, brain tumors, kidney or liver disease can cause seizures. If your cat has a high fever because of infection or has elevated body temperature from being locked in a hot car during summer it can also have seizures. Finally, insufficient blood flow to the brain or an injury to the brain may be the cause. Sometimes cat and dog seizures causes are unknown. 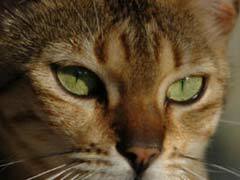 A diagnosis of feline epilepsy is made after all other possible causes have been eliminated. Keep track a journal of seizures. Of course, cat seizures while sleeping may not be as noticeable. The medical goal of treatment of epilepsy in cats is to use medication to control cat seizures. Some people claim that toxins in the cat’s food and environment are responsible for causing cat seizures. It is certainly worth trying, and even if the seizures are not controlled, you will have an overall healthier pet. Find all natural pet food. This may be a challenge at first. Health food stores for people often carry natural food for pets. Even though you are in a health food store, not everything is always all natural. Read the labels. Avoid preservatives, additives, chemicals, dyes and artificial flavoring. You may have to try several brands until you find one that your kitty enjoys. You should also get rid of the flea collar and its associated poisons. Instead, stir a teaspoon of brewer’s yeast to your cat’s meal every day. Over a relatively short period of time the fleas won’t like your cat’s blood.